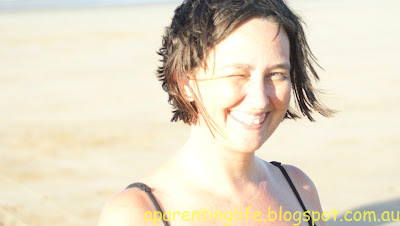 A Parenting Life: About Me Update. So it is that time of year again when I have felt the need to update my about me page. The fact that competition judges are popping by at this time of year, has nothing, well not much, to do with it I am sure. While I can't actually locate them right this very moment I am sure that I have preserved all my previous about me updates. It kinda feels like another way of persevering my growth and development both as a person and writer over time. Anyway I hope that you will agree with me that the newly revised version is the best so far. Mind you I have just realised that I failed to really introduce the children. Minor detail I know. So without further ado I give to you for the sake of prosperity my old about me. Now according to my research all the good bloggers take the time to create an about me page. So here is mine. In a nutshell I am mum to three beautiful girls. For the purpose of this blog they shall be known as Miss 11, Miss 6 and my baby Miss 2. Not exactly the most original of names I know but it does at least provide the illusion of some anonymity. I am also wife to a wonderful and much loved husband. He is my rock, my everything, including my childhood sweetheart. Though I still had the pleasure of many a toad before my knight in shinning armour and I were able to get our act together. Without him I would be lost and without sounding to cliché he completes me. We have decided to make ends meet on a single income. I am rather pleased with the fact that I get to be the one that stays at home and gets to do the kid thing. Traditional full time paid employment is something I hope I never have to go back to. I have always dreamed of being a famous writer and in recent years I have been taking steps (albeit small ones) towards making that dream come into fruition. I still have a rather long way to go, but apparently getting there is half the fun. I tend to blog about almost anything but mostly it is just about my day and the thoughts that have fluttered around my head at some point. I believe in fairies, being kind and appreciating all that you have. I love breastfeeding and cloth nappies. I would like to say I am crafty but that would be a slight distortion of reality. I still try on a regular basis though and every now and then I get lucky and something comes out not looking too bad. I Love Your Blog, and You! I must confess I am awesome, or not. Breaking all the rules. Well some of them anyway.